PHOENIX – Fans who make their way to Phoenix Suns or Phoenix Mercury games will have to get used to a new name for the teams’ home. 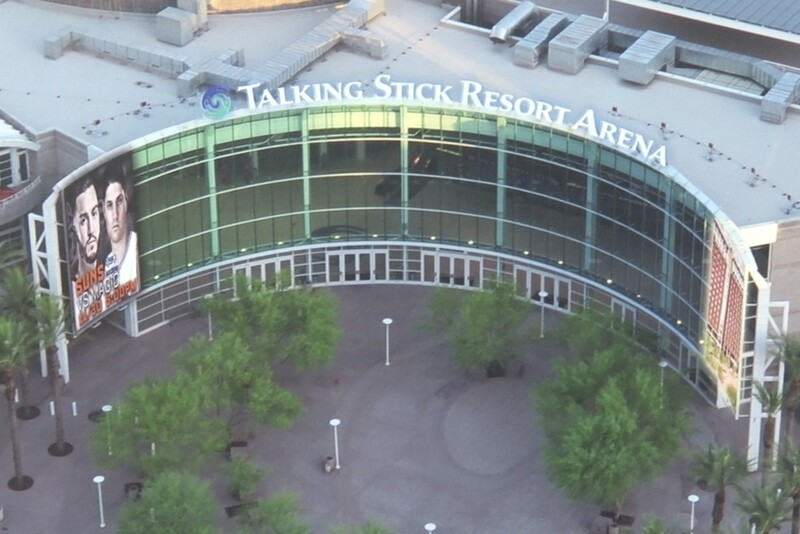 The US Airways Center will soon be known as the Talking Stick Resort Arena. Diane Enos, president of the Salt River Pima-Maricopa Indian Community, announced the new name Tuesday while Phoenix Suns dancers revealed renderings of the arena’s new signage. 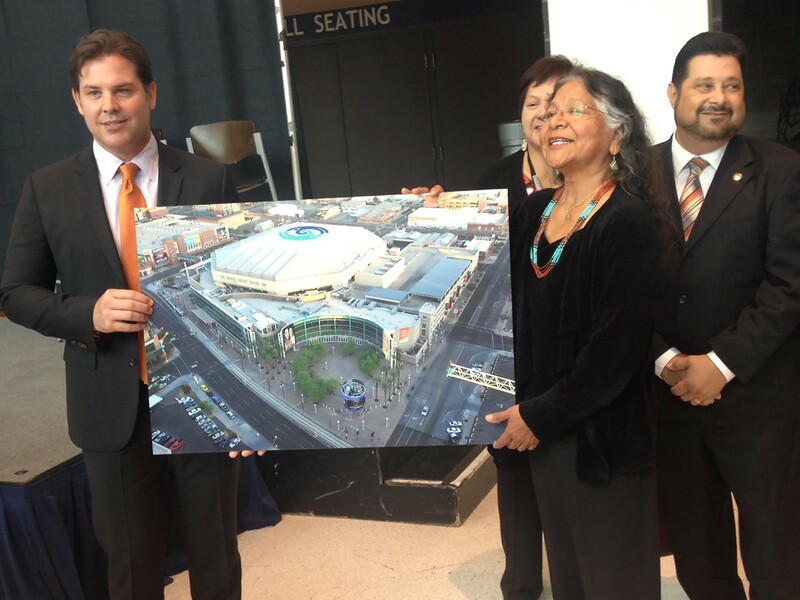 “The land on which the arena sits originally was part of the tribes reservation. This is our aboriginal territory,” she said. It’s the second Valley arena to be renamed after a casino this year. The Glendale home of the Arizona Coyotes was officially named the Gila River Arena in September through a nine-year agreement. The downtown Phoenix venue opened in 1992 as America West Arena before becoming the US Airways Center in 2006. Phoenix Suns President Jason Rowley said the partnership with the Salt River Pima-Maricopa Indian Community broadens an agreement under which the arena’s grand entrance is named after the tribe’s Casino Arizona. Rowley declined to comment on the financial terms of the partnership and the cost of the transition. “The partnership amount is a multi-year deal; in terms of investment, I won’t get into that,” he said. Among other things, the change will be seen in the signage in and around the arena. The names on the west- and north-facing parts of the building, bottom of the scoreboard and the playing surface will all reflect the new Talking Stick Resort Arena emblem. Rowley expects the transition to be complete by the beginning of the 2015-2016 Suns season. “The current name will stay on the building throughout the season and we will make the transition during the summer,” he said. Arena employees gathered for the renaming of the venue that has been home to the Phoenix Suns, Phoenix Mercury and the Arizona Rattlers for more than a decade. It's the second name change since the complex opened as America West Arena in 1992. Diane Enos, president of the Salt River Pima-Maricopa Indian Community, and Phoenix Suns President Jason Rowley display an artist's rendering of signage that will adorn Talking Stick Resort Arena in downtown Phoenix. 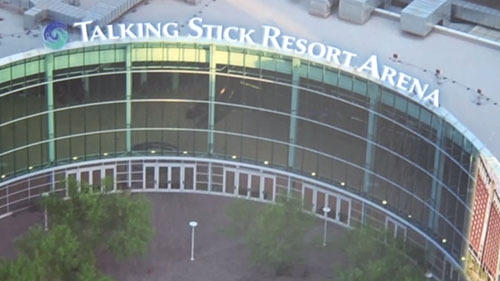 An artist's rendering shows how the name Talking Stick Resort Arena will be displayed above the entrance.